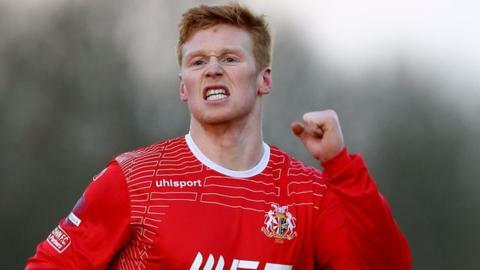 Portadown defender Chris Casement is set to miss the Irish Cup final against Glentoran after being hit with a six-game ban for a head-butting offence. The IFA Disciplinary Committe handed Casement the suspension for an alleged incident involving Dungannon Swifts midfielder Terry Fitzpatrick during an Irish Premiership game last month. The 27-year-old's ban was upheld at a hearing on Tuesday night. The ban commences on Monday but Portadown do have a right of appeal. It is believed that Portadown used video and verbal evidence, including testimony from Fitzpatrick himself, to support their case that Casement should have his red card rescinded. The former Linfield defender will also miss his side's final Premiership game of the season against the Blues on 25 April, plus the first four matches of next season. Ports midfielder Robert Garrett was sent-off seconds before Casement's dismissal for a stamp on Jamie Glackin, late in the 1-1 draw at Shamrock Park on 14 March. Both players were ruled out of their side's 3-1 Irish Cup semi-final success over Ballymena United the following week as they were serving automatic bans. Ronnie McFall's side will face the Glens in the cup decider at the Oval on 2 May.